Americans focused most closely last week on economic news amid continued reports about the weakness of the recovery, while the media gave the most coverage to the scandal involving New York Rep. Anthony Weiner. About a quarter of the public (23%) says the economy was their top story of the week, according to the latest News Interest Index survey conducted June 9-12 among 1,002 adults by the Pew Research Center for the People & the Press. By comparison, 13% say they most closely followed news about Weiner’s admission that he sent sexually suggestive photos and messages to several women online. In that regard, most Americans (63%) say news organizations are giving too much coverage to the scandal involving the Democratic lawmaker. Weiner’s troubles accounted for 17% of coverage, according to a separate analysis by the Pew Research Center’s Project for Excellence in Journalism (PEJ). News about the economy made up 11% of the newshole. About four-in-ten (39%) say they followed reports about the condition of the economy very closely, more than double the number following any other top story that closely. The level of interest is comparable to one week earlier (35%), when the news included downbeat reports about the health of the job, housing and financial markets. Just 15% say they very closely followed news about the Weiner scandal, which unfolded over the course of the week with his initial admission, additional revelations and calls for his resignation from Democratic leaders. About a quarter (27%) say they followed this story fairly closely. But more than half say they followed it not too (23%) or not at all closely (34%). Interest was comparable among men and women and among Republicans, Democrats and independents. Interest in this story is similar to interest in several recent scandals involving lawmakers or governors. Those include the admission in June 2009 by then-Gov. Mark Sanford of South Carolina about his affair with an Argentinean woman or the arrest in September 2007 of then-Sen. Larry Craig of Idaho for disorderly conduct in an airport bathroom. However, the public expressed greater interest in news about the resignation of former New York Gov. Eliot Spitzer in March 2008 after revelations about his use of prostitutes or the October 2006 resignation of former Florida Rep. Mark Foley, who had sent inappropriate messages to young congressional pages. Nearly two-in-ten (18% each) say they very closely followed news last week about wildfires raging in Arizona and the early stages of the 2012 presidential election. About one-in-ten (11%) say they followed news about the wildfires most closely, while 9% say news about their election was their top story. 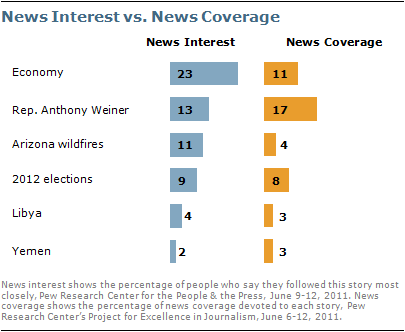 News about the 2012 campaign – focused now on the possible Republican field – accounted for 8% of coverage, while the wildfires accounted for 4%. Smaller numbers tracked developments in the Middle East and North Africa. Just 14% say they followed news about the situation and events in Libya very closely. That’s down from 21% one week earlier; 4% say this was the news they followed most closely. About one-in-ten (9%) say they followed news about the anti-government unrest and violence in Yemen very closely. This was the top story for 2%. 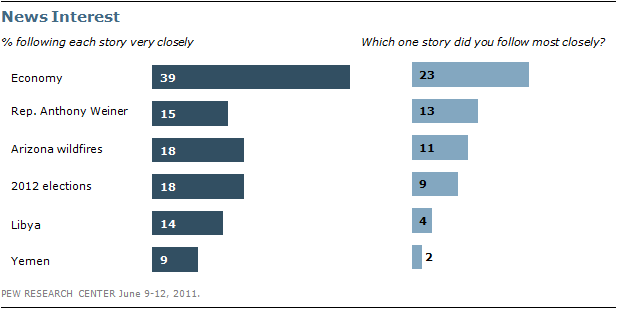 News about Libya and Yemen each accounted for 3% of coverage. Solid majorities say news organizations have given too much coverage to the Weiner photo scandal (63%) and to Sarah Palin’s bus tour of historic sites (58%). By contrast, just 11% say news about U.S. plans and policies for Afghanistan have been over-covered; 42% say this story has gotten too little media attention. Just 7% say the Weiner story got too little coverage, matching the number that says this about Palin’s tour. The sense that the Weiner and Palin stories have gotten too much coverage crosses partisan lines – majorities of Republicans, Democrats and independents offer this assessment. Still, there are modest differences in opinion by party. Among Republicans, 57% say the Weiner story has gotten too much coverage, somewhat less than the 68% of Democrats that say this. Two-thirds of independents (66%) say the same. More Democrats (64%) than Republicans (52%) say Palin’s bus tour has gotten too much attention, a view shared by 58% of independents. There are no party differences concerning coverage of Afghanistan. As has been the case in the past, few say Afghanistan gets too much media attention. But the public is now about evenly divided over whether Afghanistan has gotten too little (42%) or the right amount of media coverage (38%). For the past two years, the public has generally been more likely to say Afghanistan-related news has been under-covered than to say it has gotten the right amount. Few Americans have heard a lot about recent career changes for several prominent network and cable television news personalities and anchors. About one-in-ten (9%) heard a lot and 40% heard a little about news that Katie Couric, the former CBS Evening News anchor, will host a talk show, starting in the fall. About half (49%) say they heard nothing at all about this. Looking at a different measure, when Couric announced in April 2006 that she was leaving NBC’s Today show to join CBS News, just 12% followed this news very closely. Nearly as many had heard at least a little about Meredith Vieira’s departure from NBC’s Today show: 14% say they heard a lot about this and 31% say they heard a little. Still, 54% say they had heard nothing at all about this. Women are more likely to have heard a lot about this story (19%) than are men (9%). 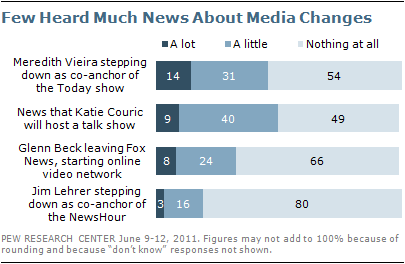 Those with more education also were slightly more likely to have heard about Vieira leaving the Today show. Her last day was June 8. Almost a third of the public says they had heard at least a little (8% a lot, 24% a little) about Glenn Beck’s plans to leave Fox News and start his own video network online; two- thirds (66%) had heard nothing at all about this. Republicans (14%) are more likely to have heard a lot about Beck’s plans than are independents (7%) or Democrats (5%). Beck is leaving the Fox News Channel at the end of this month. About two-in-ten heard at least a little about Jim Lehrer stepping down as co-anchor of The NewsHour on PBS (3% heard a lot, 16% a little). A large majority (80%) say they heard nothing at all about this. Men and people with more education were somewhat more likely to have heard about Lehrer’s departure. His last day was June 3, though he will continue to be a part of The NewsHour on Fridays. These findings are based on the most recent installment of the weekly News Interest Index, an ongoing project of the Pew Research Center for the People & the Press. The index, building on the Center’s longstanding research into public attentiveness to major news stories, examines news interest as it relates to the news media’s coverage. The weekly survey is conducted in conjunction with The Project for Excellence in Journalism’s News Coverage Index, which monitors the news reported by major newspaper, television, radio and online news outlets on an ongoing basis. In the most recent week, data relating to news coverage were collected June 6-12, and survey data measuring public interest in the top news stories of the week were collected June 9-12 from a nationally representative sample of 1,002 adults.